Wanderlust: Conquering the Majestic Beauty of Matigol Falls - Choose Philippines. Find. Discover. Share. Trekking may be easy-peasy for backpackers. But for someone who has a sedentary lifestyle like I do, going out for an extreme adventure may be a challenge. But instead of doing my usual travel to the white sand beaches, my buddies and I decided to do something different to challenge ourselves. We went out for a trip to Matigol. Matigol is a small village and home of Manobo and Tahurog natives located at Sitio Ladayon, Arakan Valley, North Cotabato. 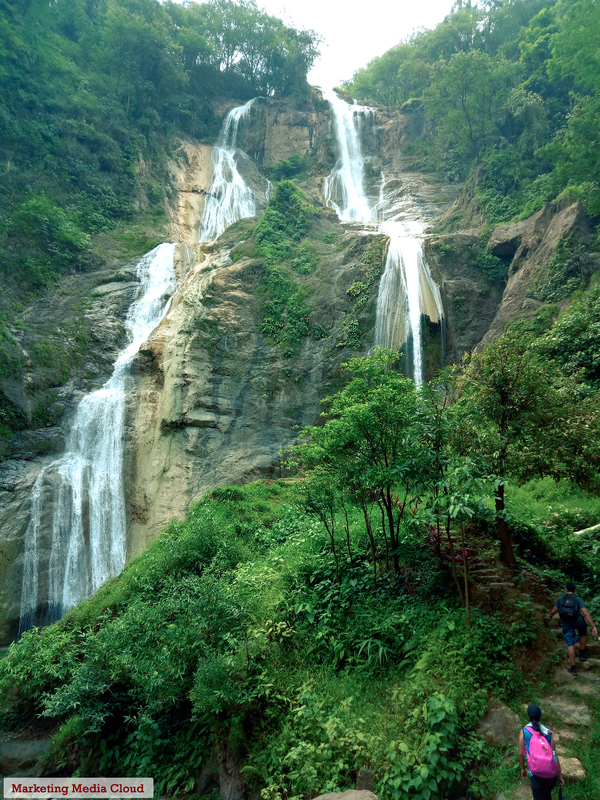 Here, you can find its hidden jewel – the enchanting beauty of Matigol Falls. Covered with luxuriant green foliage clothing every hill, this picture perfect scenery has really captured us for a big leap. We finally had the guts to push ourselves to the limit. We felt an adrenaline rush as we explored the Matigol Falls. Hearing the loud waters was heart-pounding. Going to Matigol Falls is an hour and a 47-minute drive from Davao City via Buda road. Turn left at Campo Uno, Katipunan Road and drop off at Barangay Matigol. You can also take a bus going to Buda with a P100+ fare and drop off at Campo Uno, Katipunan Road. Then, Ride a Habal-habal Motorcycle going to the village for only P100. From there, we started our 45-minute walk going to the main village for registration and hired a local tour guide. The Tahurogs gave us their warmest welcoming smile and giving us their utmost hospitality. Our tour guide “Dodong” briefly explained how we can totally enjoy the view of this 500-meter waterfalls. And so, our journey to Matigol Falls begins. *Registration fee is P35 and tour guide fee is P300. Our first trail had uphills and downhills filled covered in cogon grasses. The grounds were cracked and the root crops looked dry. Dodong said that there was no rainfall for 2 weeks in Matigol. But, we are still fascinated none the less with the beauty of the open field. Thirty minutes later, we were tired. The heat of the sun was taking its toll on us. We were all walking slowly. But, we still had fun taking several group photos, selfies and made sure that everything was documented. Fifteen minutes more and we saw running water falling from a mountain. The Matigol falls looked beautiful! We were excited to rush to the rapids and surge, but we had to go through a 70-80 degree descending trail, holding only grassroots and old tree roots. One of my travel buddies fell down and got some bruises until we’ve reached Level 1 of Matigol Falls. We took our lunch and relaxed before finally hitting the waterfalls. We also explored its hidden cave. It was late afternoon when we started to go to the second level of the falls. It was the most difficult part of the trek. It also began to rain, which made it more challenging. Finally, we reached Level 2. Our tour guide said that we should stay for a while until the rain stops because it is too risky to climb up to Level 3. So we got to enjoy the view of the mountains and the falls a little longer. We began climbing to the tihird level of the falls and it was a challenging one. Trails became slippery because of the mud and rain. But, when we reached the top of the falls, it was really fulfilling. The scenery was majestic! The falls surrounded by lush green trees and wild floras looked magnificent. At that moment, I felt that I made the best decision of taking on a new adventure. We will never know our limits if we don’t take risks. Facing our greatest fears can be the hardest decision we have to make. But, this can also lead us to see and experience the most beautiful parts of the world. So, don’t just settle for a simple trip; instead, always aim for an extreme feat.